Brunfelsia americana, Lady of the night. It is sought after for the masses of flowers it will produce when happy. 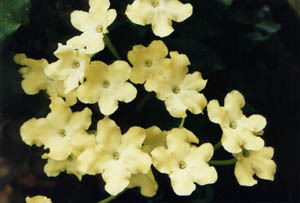 New flowers are white and fade with age to yellow. Named Lady of the Night for its powerful fragrance in the evening, but it is mildly fragrant during the day also. Berry like fruit sometimes follow the flowers. Great for containers. A little pruning is recommended. The Lady of the Night is perhaps the most fragrant of the Brunfelsias. Brunfelsia's grow in full to partial sun. The soil has to be kept moist. Use a liquid fertilizer like miracid once a month. They can be trimmed if they get too leggy. Flowers appear on and off during the warm weather. Avoid freezing temperatures.